510 bigger screen than Garmin 500. Wireless uploads are a great idea. The problem is with the 510, you need to use a bluetooth connection in your phone. And upload via the Garmin connect App. 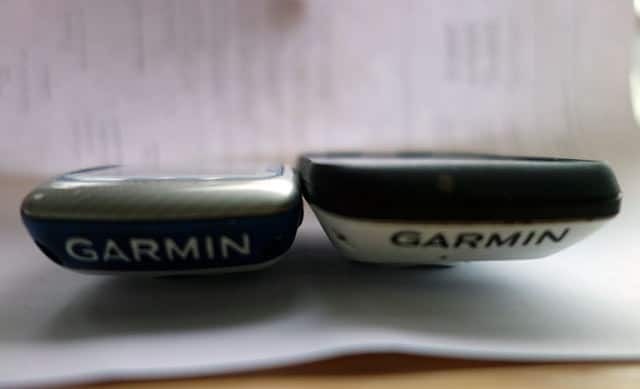 (The Garmin Connect App has many negative reviews on Apple, scoring less than 50%) It doesn’t take long to pair your Garmin to your phone. But, it’s still an extra step and many report inconsistent ability to upload. Also I just switched my phone contract from £40 a month unlimited downloads to £10 a month with limited data transfer and pay as you go. This makes me reluctant to start paying for data. I feel here, Garmin missed a trick. They should have produced a unit that could upload directly to the web / Strava e.t.c without using a phone. The technology is there, but I believe they didn’t want to do it because of GPS upload protocols in countries like Brazil or something like that. They have left a gap in the market for someone to come in a provide cycle GPS units which go direct to your computer and small! As it happens, I’ve been mainly using the usb wire to upload data so far – it seems simpler. I haven’t got around to using the wireless bluetooth connection, which is ironic as this is supposed to be the main advantage of the Garmin 510. With a Garmin 510, you can have Live tracking so people can watch you going up and down the A40 on their computer. I have no interest in this feature. The only possible scenario when you might want to offer live tracking would be if you were doing a Lands End to John ‘O Groats record attempt. But, if you’re doing a 72 hour record attempt, you probably don’t want your mobile phone battery to be drained after five hours, so wouldn’t want to use it. 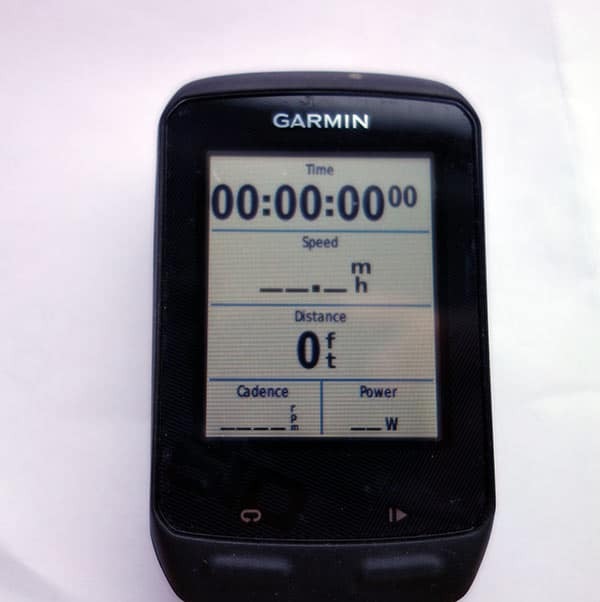 The Garmin 510 has only three buttons – on/off. Lap button and start stop. 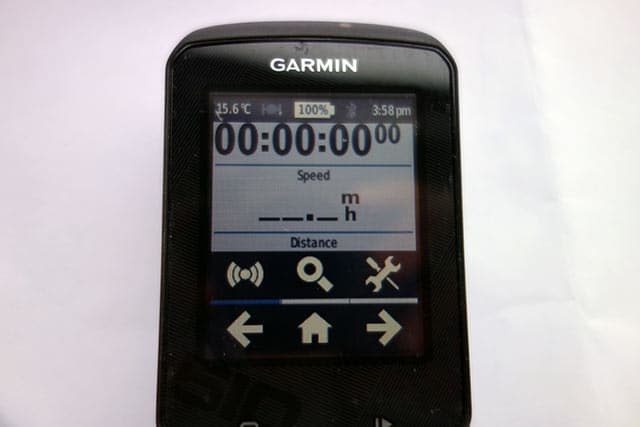 The Garmin 510 also uses screen touch to move between screens. In theory, it is easy to slide between your different screens by swiping across the screen. But, with big gloves (or even without) it doesn’t always work properly and you have to hit some more buttons with your fat fingers. Swapping between screens is not as intuitive as it should be. In a way I prefer the simplicity of Garmin 500 buttons which are more reassuring than the Garmin 510 touch screen. Another thing to remember, is that if you are used to an Apple super-quick touch screen – the garmin has perhaps a second delay. This means you keep thinking your button press didn’t work – but, you just have to wait a fraction longer. On the plus side it does work with gloves. Fortunately, the lap button and start/stop is still a good old fashioned button to press. Touch screen – I could take it or leave it. It’s not a big deal. You can lock the touch screen, by pressing off button for a short time, and choosing the lock button. Route mapping. You can save favourite routes, these routes are then sent to your Garmin 510. Routes can also be downloaded from phone. Live weather updates from your phone. You can set different screens for racing / training to have different preferences. You can choose different metrics for different factors, e.g. distance, elevation, temperature, weight. So you can have a mix of British miles and European metres for height gain. You can define settings for up to 10 bikes, which is a big advantage over 500. For example, you can set up a Time Trial bike and have screens for power output e.t.c. But, when using winter training bike, I can leave out power screens. It also enables you to see mileage for different bikes, which is useful for changing chains. It uses the same mounts as Garmin 500. The battery life is very good on the Garmin 510. 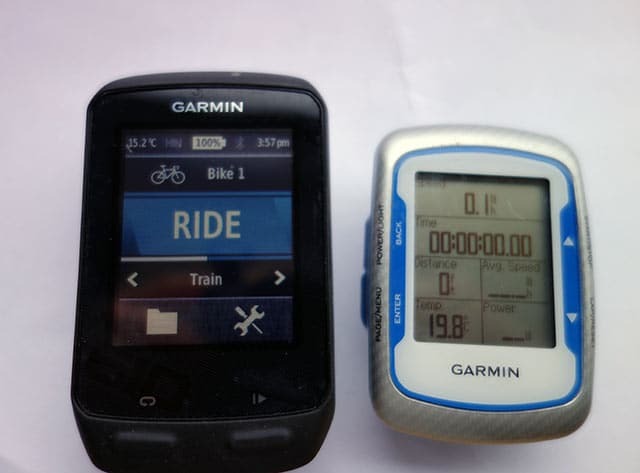 I haven’t tested to 20 hours, but it goes down much more slowly, and if not quite 20 hours, it will do most epic rides – I found Garmin 500 to be much less than the estimated 18 hours. 510 uses a better satellite network than general GPS used on the 500. The Edge 510 has about 9.5 MB of free space on it for workouts so you can ride for 95 hours without having to upload. I find the screen on the Garmin 510 quite dark. The Garmin 500 is brighter. It’s a lot more expensive! I don’t really value wireless uploads via Bluetooth as essential. Though at least it won’t become useless if it stops working like the Garmin 500. I won’t use live tracking. 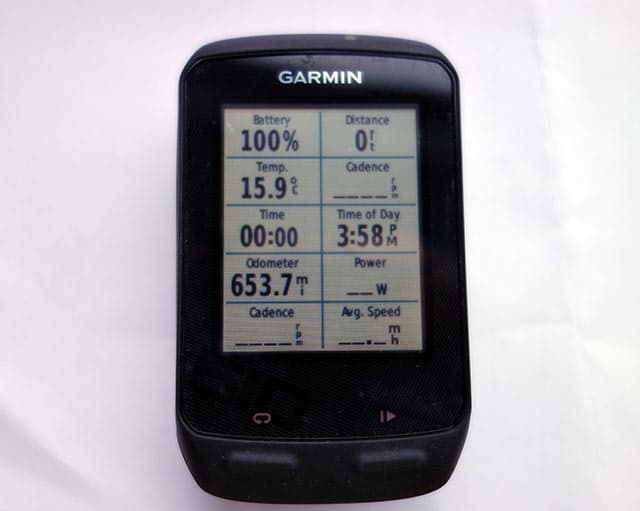 The Garmin 510 has a few nice features, but it is worth thinking more carefully, if you will really use them. I don’t think the Garmin 510 is worth the extra money over a 500. Especially now that you can pick up a Garmin 500 for nearly half the cost. But, I don’t like being overwhelmed with options, and don’t value some of the features of a Garmin 510 – which other users might. If you’re going for a really chunky screen and device, you might as well get a Garmin 800 with maps. I never had those problems you describe with the 500, so for me the only times I think about the 510 is when I consider being able to track more bikes, and the bigger screen. I think also the font seems to be a bit better on the 510 – on the 500 you only really have 2 sizes to display things: big (when taking up half the screen for one field, and small (for everything else). That picture with the 510 displaying time/speed/distance in big size and cadence/power in small, looks very attractive in comparison. With my 500 connecting to the computer, gps connection and accuracy, battery life are all doing reasonably well. So in the end I can never convince me to “upgrade”. As for the computer connection, I did not install the garmin software on the computer. I just connect it like a USB external drive, and upload manually. Works very reliably. Sometimes rarely I have to wait a minute for the device to show up, but no huge delays. Normally I’d be hankering after the latest gadget (I’ve just upgraded to an iphone6+, but for some reason I have never felt the need to upgrade my 500. 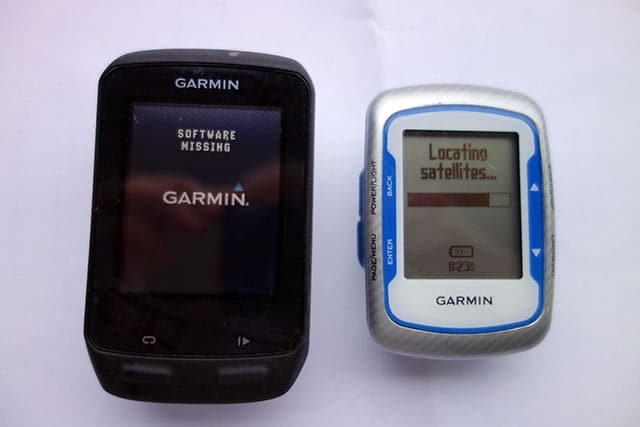 My original 500’s GPS developed a fault after 20 months, sent it off to Garmin and they replaced it FOC, they even sent the GSC10 and Premium HR strap with it even though I’d only sent them the unit. The 500 shows me whatever I need to know and it feels really robust. Like you, live tracking isn’t a feature I need, if mrs murph needs to know where I am she can “find my iphone”, wireless connection would be nice but I have a laptop so it’s no real issue. I think the 510 actually makes the 500 an even better choice now because of the price difference.